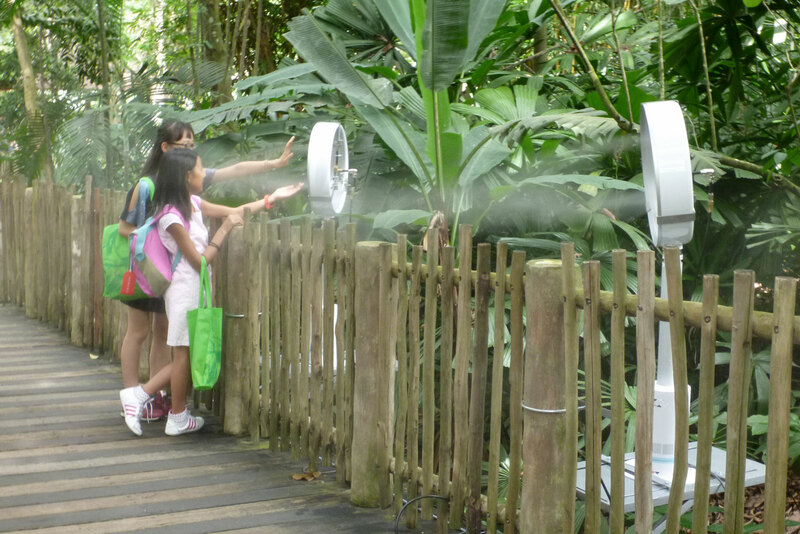 In warm and humid climates, misting systems are often installed to improve conditions in public spaces. However, people often reject them as they are sprinkled with water droplets and disturbed by noise. 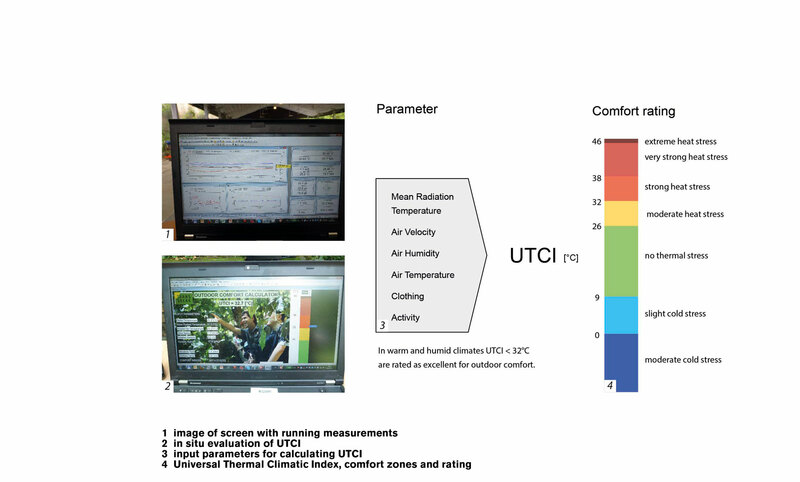 When the Transsolar engineers studied the process with advanced human-biometeorological models they found that fully developed adiabatic cooling and elevated air speeds could, in theory, create a great improvement of outdoor comfort. Initial experiments by Transsolar showed that such a process could be realized with very small droplets created by specially designed high pressure nozzles and the focused air flow of a fan. As the droplets fully evaporate and people feel only a cold breeze, we called the technique Dry Mist. 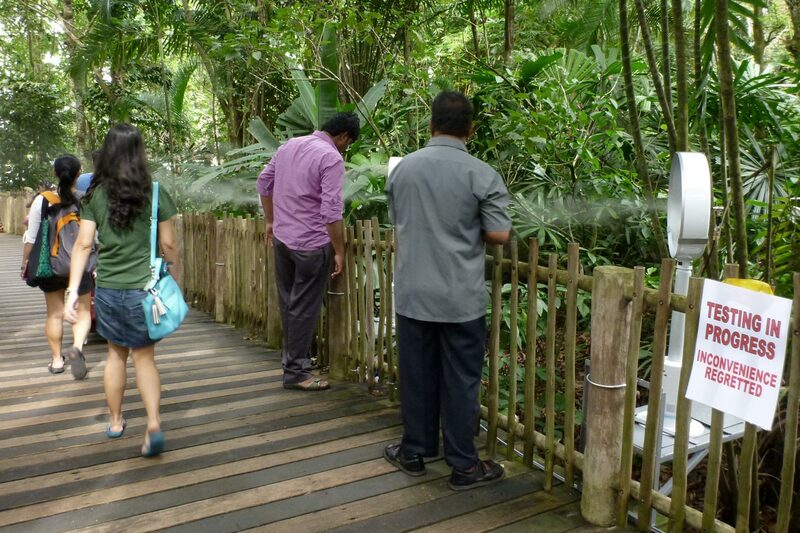 This innovative combination was first tested with advanced human comfort metrics in August 2014 at the Singapore Zoo. 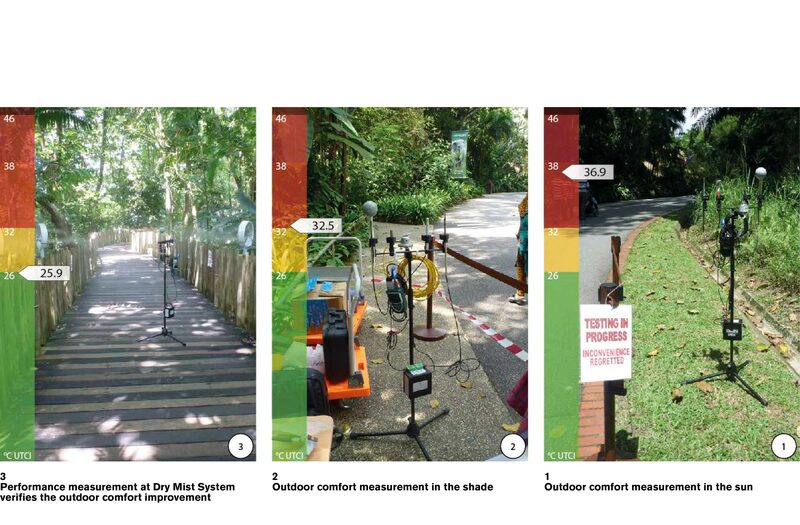 With the Dry Mist system installed, a reduction in the Universal Thermal Climatic Index (UTCI) of more than 6°C even in the very humid tropical zoo was measured. Still, many people have had bad experiences with conventional misting installations and are not convinced by good scientific numbers. But people are human sensors! 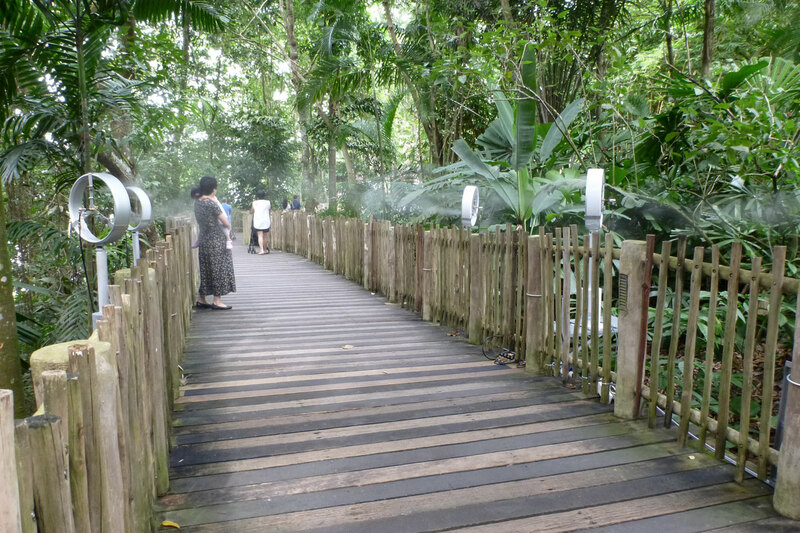 So for the national day in August 2014, the Dry Mist system was installed along a busy path and the visitors and their reactions were observed. Visitors did not know they were part of an experiment. Their reaction indicated that the cool breeze was more than welcome; it made them slow down, rest and enjoy the ambience. So the reaction of the people, not the carefully taken scientific readings - became the unique convincing point for the Dry Mist concept. The design is highly energy-efficient. 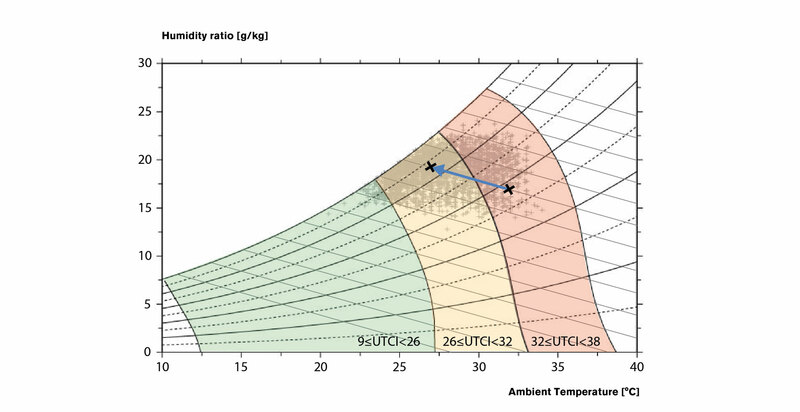 The coefficient of performance (the ratio of adiabatic cooling to electricity demand) is about 20, thus 4 times higher than conventional air conditioning. Each fan can treat an area between 9 and 15 sqm while using a maximum of 5.4 liters of water per hour. 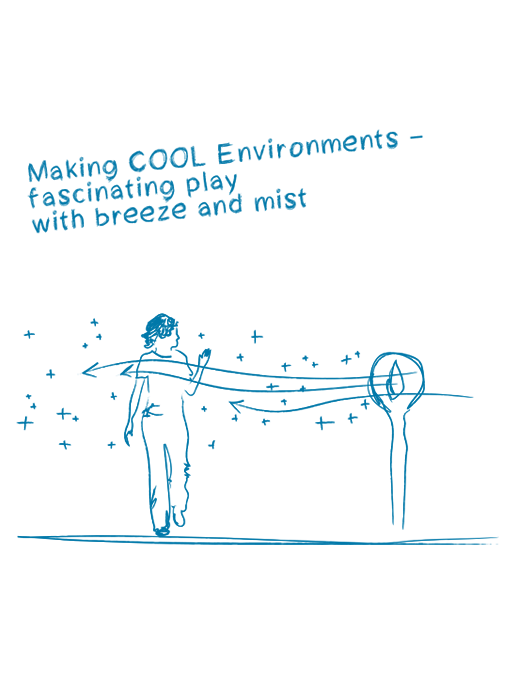 As aerosols are created that can be inhaled, the water quality is very important. Therefore, only pure drinking water is used, additionally upgraded by a three-stage filtration and sterilized with a UV process. 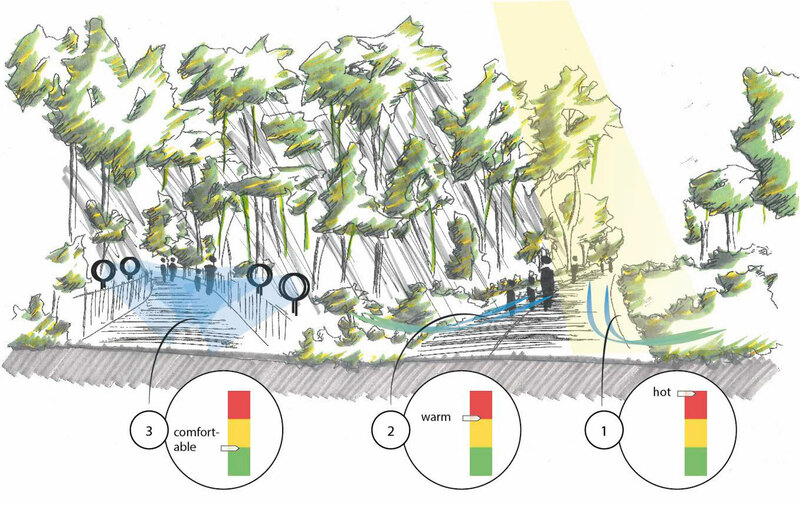 This low-tech and low-energy solution has the potential to improve public spaces ranging from outdoor train stations waiting areas to plazas and parks. In 2015, the Dry Mist concept was successfully applied in the EXPO pavilion together with Team.Breathe.Austria. At present (as of Sept. 2018), permanent or mobile plants are currently under development in Hyderabad in southern India, in Singapore, on the Caribbean Cayman Islands and in Doha, the capital of Qatar on the Persian Gulf.